It began with a book. I wish I could say it began with a centuries-old work of literary genius; a philosophical masterwork that has inspired great social movements. However I cannot pretend that Yes Man by Danny Wallace neatly fits that bill. But my desire was philosophical in nature, even if the book doesn’t squarely fit in that genre: is it possible to retrain one’s brain to be rid of the fear of failure that prevents one attempting new things, and gain instead an excitement and thrill for experiencing activity yet untried? The resultant self-imposed ‘yes woman’ dictat led me to to the climbing gym within 48 hours of arriving in Wellington, and two hours after that I had signed up to a rock climbing course that would change a lot of things about my life. Yes Woman took me to a yoga class at the tramping club, whereupon I was invited into a whole new world of adventure. I could spend every weekend in amazing places with wonderful people, with a shared sense of mission and of team that had felt lacking in my life. But then the winter came and with it the realisation that the tramping fun might have to end: snow was cutting me off from the peaks I wanted to summit and from my quest for ever greater heights and more inspiring views. A solution came in the form of the New Zealand Alpine Club’s introduction to alpine skills: an entry point into the world of mountaineering. Yes Woman signed me up. In spite of my tentative footsteps in even a dusting of snow; a childhood spent avoiding sledging; the fact I used to divert my walk to work on cold days in Edinburgh when the hill got too icy for comfort. I was uneasy about Yes Woman’s decision. 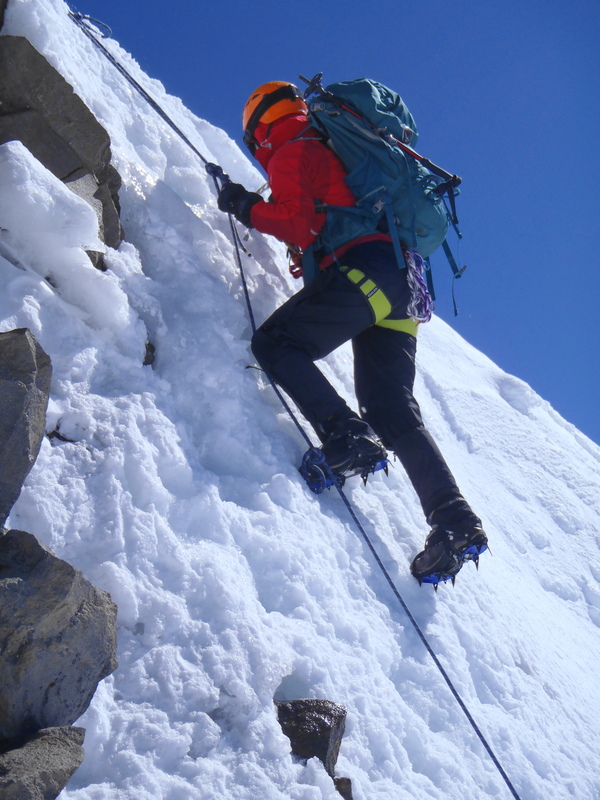 I wanted to push myself but both my fear and my concern about the implications of mountaineering – putting oneself at extreme yet avoidable risk – made me uncomfortable. But I decided to go ahead and find my limits – and at that point call it a day, Yes Woman or no Yes Woman. 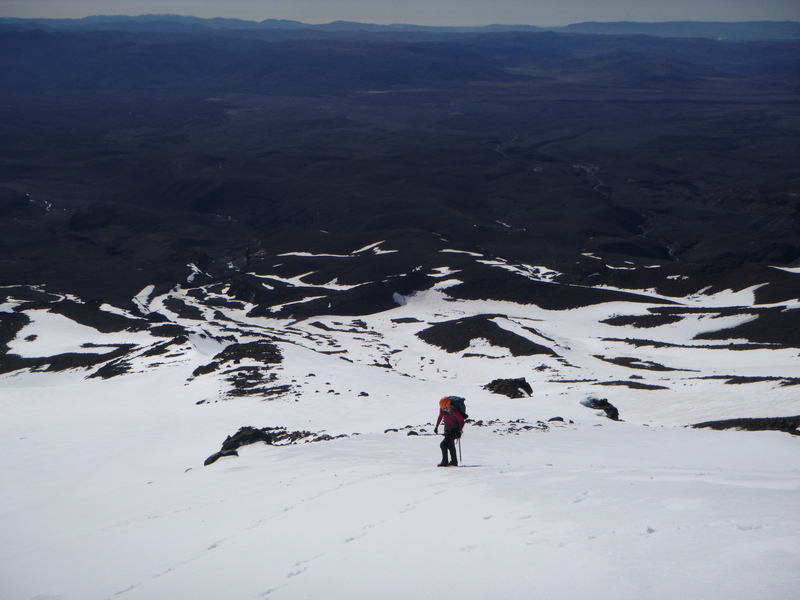 I found those limits on Ruapehu one weekend in late October. At 6.30am on Saturday we began our ascent of the east ridge of Te Heuheu. Ngauruhoe was glowing in the morning light and the bluffs of Ruapehu were a warm inviting senna, but Te Heuheu peak itself was imposing more than inviting. Being well into Spring, the snowline was far above our base on the Tukino skifield so I was glad to have the chance to warm up my muscles on the soft volcanic soil and clambering over the scattered rocks. But the snow came upon us sooner than I wished, and I took tentative steps in my boots on the icy stiff patches. The joy that I feel in that moment of swapping from tramping boots to the wondrous archaic invention that is a pair of crampons never ceases. Oh what friction! Oh what grip! Oh what a shift of confidence! After dropping into a bowl and up over a saddle, the slope began to steepen and the exposure increased. I tried to keep pace with the others in the group as we zigzagged up the slope, but didn’t succeed. I avoided looking out behind me so not to lose my nerve and focussed on my feet, my grip and the steady rhythm of my steps and axe working together. I reached a slight plateau where a rock provided a little shelter from the increasing wind and a little sense of security amidst the unrelenting slope. My confidence wavered, but faced with the prospect of descending the snow alone, going up felt like the better option. This was the first time I had been out snow without my close friends around me reassuring me when I got nervous and showing me where to place my steps. As we headed up the long ridge, the gradient increasing all the time, I had to find those reserves of confidence alone, and this realisation itself helped me to focus, keep calm, and trust in my technique. 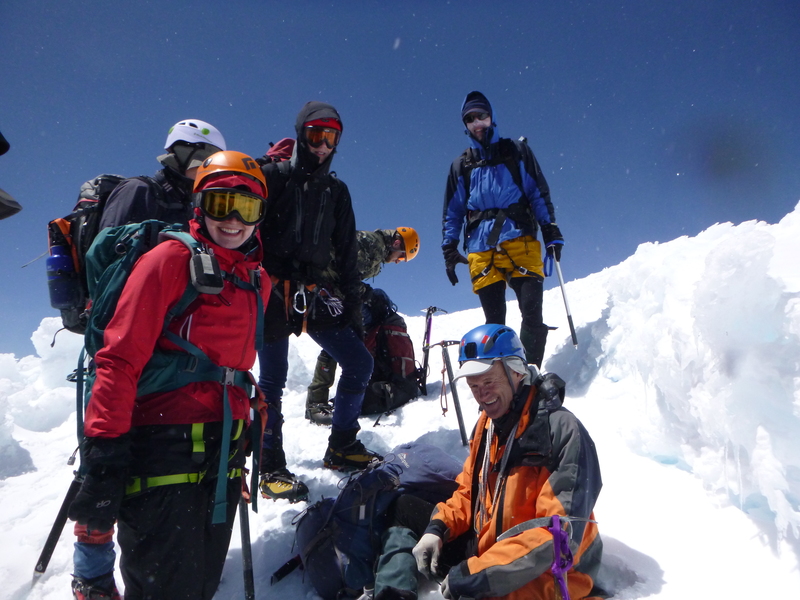 At the first of two ‘steps’ – steep sections of snowy ice – the first in our party to arrive had set up a rope for security, pivoted around a snow stake in a simple belay. I found great safety in the rope’s presence. I tried not to use it and to rely on my climbing skills instead but it was too tempting not to pull myself up using the knots. After the step, I declared myself a mountaineer, since the harness around my waist had now been put to use. From this point, the gradient of the ridge was at its most extreme. I dare not look out at all. I longed for the cloud to rise to obscure all visibility. I left with two others, walking ahead of them and setting a steady pace. As I reached a short plateau I had my first striking views of Ruapehu from above: a swirling mass of peaks and lines, snow and shadow. But this spot was exposed to the wind and I feared I may be blown off my feet so I kept moving to the right. I reached the second step but the others had already passed it and were out of sight. A trail of footsteps to the right told me I would be traversing below the step rather than ascending it. Ten metres into the traverse, I realised I was alone. I surveyed my situation: I could see no-one ahead, and no-one behind. I wasn’t clear whether those behind me had realised where I got gone. Had I picked the wrong path? Were they taking an alternative route up? 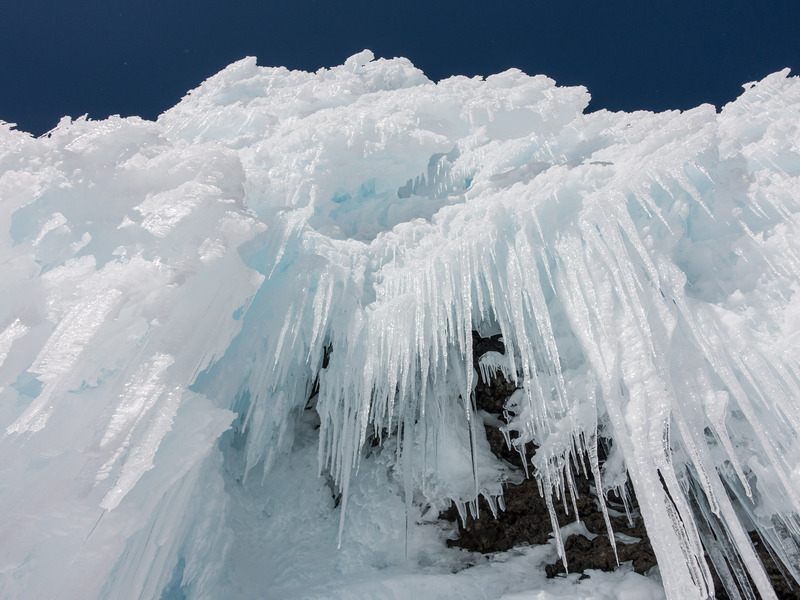 I looked out over the long steep slope below, I looked down at the stack of soft snow that was bearing my weight at the top of this sun-soaked slope, and I looked up at the enormous glistening icicles above my head. I secured my footing by kicking in my feet and stabbing in my axe, and I panicked. After a few minutes I regained control and decided my current position was not safe. I walked back towards the left, out from underneath the icicles. From that point I could see the remainder of our group, and I waved so they would know my position. Then a few moments later, a friendly face appeared from the right hand side. My relief was probably not evident to him as I called across to him, demanding he ply me with reassuring words. He duly obliged and helped me regain the momentum to finish the traverse. From there it was an easy walk to the summit, but I was in such a state of shock from the experience of the ascent and the final traverse that I barely took in where I was. I didn’t speak for twenty minutes. It felt like an hour since we had left the lodge, but it had been five. We had ascended 1000m. I was dizzy with adrenaline and full of dread for the experience just passed and in that moment I decided I would never put myself in that position again. We headed out along the ridge and over Tukino Peak, and only then, once I realised that the gradient and exposure I had just experienced would not be repeated, I finally relaxed. I began to smile, acknowledged what I had achieved, and was able to enjoy the environment. When some of the party decided to abseil over an edge rather than take the ‘long way’ round, I announced I would join them. Yes Woman didn’t tell me to do this. I saw an opportunity to do something I had not done before and I wanted to do it – not least because since I had just decided my alpine days were over, I may not get another chance. I helped dig the channel for the snow bollard and heard myself volunteering to go first. I steeled my nerves, lowered myself over the edge and descended slowly to the bottom of the rope. The rope ended a lot sooner than I had hoped, and it dawned on me that I was only a quarter of the way down the face. I experienced the same self-determination from the ascent: I was alone, and I had no choice but to deal with the situation. So I unattached myself from the rope and began the long downclimb, kicking in my crampons hard to get good purchase and trusting my ice axe to hold me. Every time I looked down the ground seemed no closer. I steadied myself against the ice with my free hand, and rued my decision to wear my thin gloves; my hands getting colder and colder as my gloves became increasingly frosted up with hundreds of small balls of ice. Finally I reached flat ground and I beamed with joy as I walked across the summit plateau to join those who had taken the more straightforward route. From the plateau we took a detour to visit Whangaehu Hut, the snow ever softer underfoot as the day wore on. The afternoon sun bathed us in heat as we skirted round to the ridge alongside the Whangeahu glacier. We arrived back at the lodge shortly after 5pm, and sat on the deck watching the sun go down over the mountain and celebrating our successful ascent. I have spent months pushing myself to do things that I would never before have done, and it has been a richly rewarding experience. On Te Heuheu I achieved things I never imagined I would achieve. So this trip in some ways feels like the culmination of my quest ever to expand my comfort zone and change my long-embedded thought patterns and ways of approaching new things. I no longer need to use a mantra to push myself out my comfort zone; instead I want to do it because I trust that the consequences of giving it a go will be uplifting. But on Te Heuheu I found my limits. The reward of being in the mountains on snow is great but the risk is great too. The objective level of risk from the activity I undertook is a moot point: my experience of that risk manifested itself in so much tension that it outweighed the delight of making it to the top. It overshadowed the experience of spending time in a sensational landscape few get to enjoy. It brought a level of discomfort I was not able to bear. And so the day that I became a mountaineer became the day that I retired from mountaineering. Photo by Simon Williamson. My long downclimb.